Open to USA. Anyone who successfully passes KYC can purchase. MasternodesWIRE fosters a decentralized and worldwide network by utilizing staking and masternode implementation. Token holders can earn network rewards (token minting) by keeping their wallets open and staking or by using 35,000 WIRE tokens for collateral and creation of a masternode. Privacy Security and Privacy were a top priority in the creation of the WIRE token. Coin mixing and ZeroCoin protocols have been integrated into WIRE. Both of these features allow for transaction mixing, anonymous sending and freedom from prying eyes. Earn Program Linking your personal social media account to the Social Wallet platform will engage the EARN feature. Social Wallet will maintain a consistent media presence across all social networks. 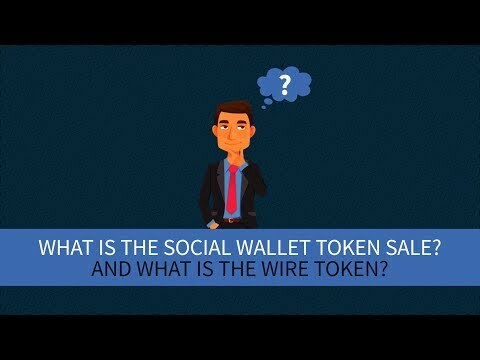 Social Wallet posts will be visible on the platform creating an opportunity for users to acquire WIRE token simply for Liking, Sharing, Retweeting, or Commenting on the company's posts. Debit Card Social Wallet has entered into an agreement with 3rd party debit card provider. All users on our platform will have the opportunity to own a Social Wallet Debit Card. Our debit card’s end user functionality will be indistinguishable from legacy bank debit cards. Convert many of your ERC20 tokens into payment options for everyday purchases. Vision and Product: A coin just to initiate payments using the social media that is wrought with fake data.